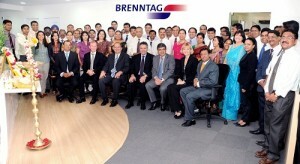 Brenntag, the global leader in chemical distribution, inaugurated its new head office in Mumbai, India. This new office represents Brenntag’s continued commitment to invest in India and to ensure the company has ample room for its planned growth over the next few years. Brenntag established its presence in India in 2008 and focuses on various industry segments such as Agro, Coatings, Food & Beverage, Leather, Lubricants, Personal Care, Pharmaceuticals, Plastics & Polymers, Polyurethanes, Solvents and Textile. The new office adds to the company’s six existing offices located in all major industrial locations in India and Brenntag’s growing presence in the Asia Pacific region, which includes more than 40 offices in 15 countries. With in-house Food & Beverage and Personal Care technical application laboratories, the new office offers value-added services to Brenntag’s customers by meeting specific requirements for the formulation and customization of various blends of ingredients and chemicals. Like all of Brenntag’s offices, compliance with local as well as international standards on health, safety and the environment at the workplace is a priority. The new head office is centrally located at Ackruti Centre Point, Andheri (East), Mumbai. It has a space area covering 15,000 sq. ft. and will have room for more than 100 employees. At present, there are 44 employees based at the new office. In addition, Brenntag has offices and distribution facilities in Baddi, Bengaluru, Chennai, Gurgaon, Haridwar and Hyderabad. Brenntag is the global market leader in chemical distribution. Linking chemical manufacturers and chemical users, Brenntag provides business-to-business distribution solutions for industrial and specialty chemicals globally. With over 10,000 products and a world-class supplier base, Brenntag offers one-stop-shop solutions to about 160,000 customers. The value-added services include just-in-time delivery, product mixing, formulation, repackaging, inventory management, drum return handling as well as extensive technical support. Headquartered in Mülheim an der Ruhr, Germany, the company operates a global network with more than 400 locations in nearly 70 countries. In 2010 the company realized global sales of EUR 7.6 billion (USD 10.1 billion) with more than 12,000 employees. Brenntag established its presence in Asia Pacific with the acquisition of the chemical distribution business of Rhodia in South & Southeast Asia, Australia, New Zealand and Taiwan in 2008. In 2010, it strengthened its position in the market with the acquisition of the EAC Industrial Ingredients business, which includes markets such as Bangladesh, Cambodia, India, Indonesia, Malaysia, Philippines, Singapore, Thailand and Vietnam. In 2011, Brenntag acquired Zhong Yung in China, thereby gaining a strong access to the Chinese chemicals market. Today, Brenntag has more than 40 offices, over 40 distribution facilities and approximately 1,275 employees in Asia Pacific. Its regional headquarters is in Singapore.